In the eighth pAsuram, parAnguSa nAyaki explains how the beauty of his face starting with his divine eyes along with all the previously explained limbs, is tormenting her. Eighth pAsuram. “Thinking ‘We cannot leave everything to the forehead’, all the previously explained limbs are tormenting me together” says AzhwAr. When the enemies arrive, as one would gather all the scattered armies and push forward at the enemies, AzhwAr is explaining how all the limbs which individually tormented are now coming together to torment him. sOdhi vattangol – is it a jyOthirmaNdalam (a sphere of radiance)? Is it a complete jyOthirmaNdalam with lotus flowers, creeper, coral, bow, cool pearl, sprouts, cool beautiful crescent having its own radiance as ornament? krishNa’s radiant divine face which is itself an ornament, is stealing the life out of me, who is having cruel sin. kOL izhaith thAmaraiyum – Though the species of all lotus is the same, there are different internal varieties such as poRkAl thAmarai, nURkAl thAmarai etc; here it is talking about nURkAl thAmarai (izhai – nUl – string/thread); alternatively, saying “lotus which is focussed on stealing”; another explanation – lotus which is having its beauty itself as an ornament; another explanation – lotus which is having its radiance as an ornament. Divine eyes. kOL izhaith thaN muththamum – The cool divine teeth which are having their radiance as an ornament. Alternative explanation – The cool divine teeth which appear like pearls strung on a thread. kuLir vAn piRaiyum – divine forehead. The eyes, the one who said “I am the strong nose”, the one [lips] who spoke about the mouth, the eyebrows which bent saying “did the lips become great?”, the one remained at the forefront [teeth/smile], the ears which stood up on hearing the name, the forehead which thought itself as the leader of all, together tormented. kOL izhaiyA … – Is it a jyOthirmaNdalam which is having many ornaments? Allegorical. Alternative explanation – Is it a jyOthirmaNdalam which is having its own beauty as an ornament? 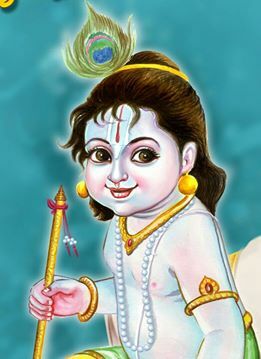 kaNNan kOL izhai … – Having krishNa’s beauty itself as an ornament and having radiant face, as the reason. kodiyEn uyir koLginRadhE – It is so tragic that I have performed sin to make me lose my life when I should get it [by seeing his beauty]. The radiant sphere of light which is decorated, is stealing the life out of me who is having the sin which makes me perish while I should be living. This entry was posted in thiruvAimozhi, thiruvAimozhi 7th centum on October 14, 2018 by Sarathy Thothathri.